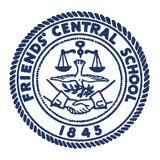 Friends' Central School (FCS) is a Quaker school which educates students from nursery through grade 12. It is located in Wynnewood, a community in Lower Merion Township, Pennsylvania in Greater Philadelphia. The school was founded in 1845 in Philadelphia, near the current location of the United States Mint. Today it has an enrollment of more than 800 students from Nursery to grade 12. Informally known as "Friends' Central," the school encompasses three divisions: Lower School (nursery through 5th grades), Middle School (6th through 8th) and Upper School (9th through 12th). The Middle and Upper Schools share their campus, and the Lower School occupies its own site. The school is widely known for the quality of its education, consistently as one of the top schools in the Philadelphia area. Friends' Central School was founded in 1845 in Philadelphia at 4th Street and Cherry Street, serving as an upper school for the Quaker primary schools with grades 7 through 12. In 1857, the school moved to 15th and Race Street, remaining at this location until 1925, when it then moved to its current campus on City Avenue (formerly the Wistar Morris Estate). The main house of the estate, constructed in 1862, remains and serves as the administrative building of the school as well as an architectural focal point of the campus. In 1988, due to the growth of the student body, Friends' Central acquired the Montgomery School's property and relocated the lower school there. Recent expansion includes construction of the Shimada Athletic Center (2000) and the Fannie Cox Center for Science, Math and Technology (2003). In 2011, David Felsen retired after 23 years of service as headmaster; beginning in the 2012 school year, Craig Sellers was named Head of School. Quaker values such as community, service, equality and integrity are all incorporated into student life. All students attend a weekly Meeting for Worship on Wednesdays for 40 minutes, sharing messages when "moved to speak". The community convenes in one room in silence and individuals stand when expressing thoughts to the community. Students are also required to perform off-campus service for a set of mandatory hours. In the middle and upper school, students are required to take three courses concerning the history of the Society of Friends and the central philosophies of Quakerism from a non-religious perspective. In middle school, 5th and 7th grade learn the history and faith of Quakerism, and the 9th grade course further explores the Quaker faith and practice, focusing on a deeper understanding of the religion's history and its testimonies. 11th and 12th graders may take additional study in the origin and philosophy of religion in general. Friends' Central School students achieved the highest average SAT scores in all three sections (Math, Verbal and Writing) of the 19 schools that had scores reported in Suburban Life Magazine's 2010 report on suburban Philadelphia private high schools. The scores were 649 in Math, 669 in Verbal, and 666 in Writing. This report also indicated that Friends' Central had a student-faculty ratio of 9:1, a yearly high school tuition of $25,400, and that 100% of the 93 students in the senior class went on to a four-year college. Of the 2009 graduating class, eight schools enrolled 30% of the senior class: The University of Pennsylvania (6), Muhlenberg College (4), Johns Hopkins (3), Haverford (3), Carnegie Mellon (3), Temple (3), Washington University in St. Louis (3), and Sarah Lawrence (3). Fourteen students enrolled at Ivy League institutions. Friends' Central has strong basketball and wrestling programs. From 2009-2012 Friends' Central won four consecutive Pennsylvania Independent Schools Boys' Basketball Championships. The Japanese Language School of Philadelphia (JLSP, フィラデルフィア日本語補習授業校 Firaderufia Nihongo Hoshū Jugyō Kō), a supplementary Japanese school, holds its classes at FCS. Hilda Doolittle (Class of 1903) - Noted poet and novelist. Raymond Lohier (Class of 1984) - a judge on the United States Court of Appeals for the Second Circuit and formerly an Assistant United States Attorney for the Southern District of New York. Amile Jefferson (Class of 2012) - NCAA Division 1 Collegiate Basketball Player for the Duke Blue Devils (2012-2017) National Championship Winner 2015. Due to an injury Amile Jefferson had to play for Duke for an extra year. Frederick Taylor Pusey (Class of 1899) - Member of the Pennsylvania House of Representatives, 1902-1906. De’Andre Hunter (Class of 2016) - NCAA Division 1 Collegiate Basketball Player for the University of Virginia Cavaliers. National Championship Winner 2019. ^ "Friends' Central School - N-12 Quaker School - Philadelphia". Friendscentral.org. Retrieved 29 December 2018. ^ "Community Profile Archived 2015-02-02 at the Wayback Machine." Lower Merion Township. Retrieved on April 30, 2014. (contains maps of Lower Merion). ^ a b "Private High Schools: 2010 Report Card". Suburbanlifemagazine.com. Retrieved 29 December 2018. ^ "The First 300: The Amazing and Rich History of Lower Merion (Part 16)". Lowermerionhistory.org. Retrieved 29 December 2018. ^ a b "Friends' Central dunks Malvern Prep in Pennsylvania Independent Schools basketball tourney final". Main Line Media News. Retrieved 29 December 2018. ^ "Directions Archived 2015-04-02 at the Wayback Machine." Japanese Language School of Philadelphia. Retrieved on March 30, 2014. "The Japanese Language School of Philadelphia utilizes the campus of: Friends Central School 1101 City Avenue, Wynnewood, PA"
^ "Alum Destined for The Great White Way!". Friends' Central School. Archived from the original on April 14, 2013. Retrieved June 1, 2012.